Need a quote? Want more information? Reverse osmosis systems (also known as RO systems) are one of the most convenient and economical methods of filtering out unwanted molecules and minerals in your water. The result is water that looks, tastes and smells better – and is much safer to use in an industrial or commercial setting. RO water purifiers work by using water pressure to force molecules through a semipermeable membrane. Impurities and other contaminants are rinsed through the drain, while the refined water is redirected to a special tank. This process eliminates 90-98% of the unwanted element in your water, depending on the water pressure and type of membrane. A huge benefit of RO water systems in Grand Rapids is that they remove elements as small as 0.001 microns. Because we are dedicated to providing the best customer experience, we have tailored our installation and operation of our systems to meet any customer’s requirements. Our systems feature horizontally-installed membranes to ensure maximum output and minimal floor space. Our flexible design allows you simple customization options for your business. 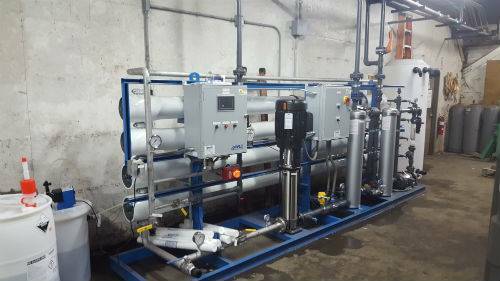 RO water systems are available with necessary pre-treatment and re-pressurization equipment mounted to a carbon steel skid and prep-piped/pre-wired. This greatly reduces installation time and costs. For periodic cleaning of the membrane elements to remove mineral scale, this package includes: skid mounted and pre-wired transfer pump, batch solution tank, inlet filter housing, isolation valves and quick disconnect cleaning ports. Besco Commercial has provided the best water softeners and water treatment products to Grand Rapids since the early 1960s. Our products and service speak for themselves – just ask any of our previous customers. We will deliver you premier water filtration that will consistently produce ultra-pure water. For more information, contact us at (800) 964-0257 or fill out our online contact form. Site Designed and Optimized by Ottaway Digital | © Besco Commercial.